b r o o k l y n t w e e d: She's Done! I'm working on a special location photo shoot, but until then here's a little peak! And a birthday treat to yourself? Beautiful! This sweater has been among my favourites for a while, and it's outstanding in red. I look forward to seeing it finished. Yummy I love it. Great job on the yoke. Absolutely stunning! Your photography is fabulous! I so want a better camera. 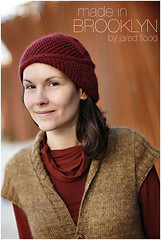 really terrific...also in my queue...now I'm going to HAVE to knit this! It's amazing! Can't wait to see more photos. What a delicious red color! I love it! Can't wait to see it in full street style! just watch all the red yarn fly off the shelves now... you're more influential than Oprah! Beautiful, can't wait to see the photo shoot! It turned out fabulous. I couldn't really tell from the last post how much I was going to love it. But I am completely smitten! Can't wait to her photo layout! She's gorgeous! I love that red, and it looks so absolutely stunning in this pattern. It's really lovely. 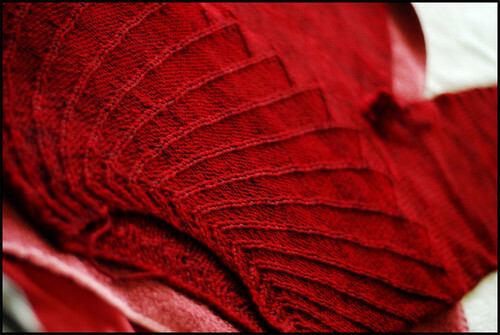 I am always drawn to red knits and this is no exception. Strangely, I wouldn't wear red if my life depended on it (it's a hair issue), but red knits really do light my fire! oooo... soo nice! what a gorgeous colour! Wicked Smart. Way cool love the rubyness. Your posts are always inspiring. Beautiful color and great stitch definition on this sweater. And she is drop red gorgeous! Mine is done up to the yoke, I'm just waiting for a little package in the mail so I can finish. That red is too perfect for words! MAN! Is that beautiful or WHAT? Is it color really that beautiful? I assume this is an E.Z. pattern. In which of her books could one find it? Beautiful work as usual. Beautiful! I am looking forward to seeing the pics from the photo shoot. Wow, gosh, yowza, looks gorgeous. Oh man, I wantwantwant that sweater! What a tantalising glimpse, can't wait to see it worn! That is so gorgeous! Love the yoke, love the colour, love the photograph. Can't wait to see more of it! Gorgeous color!!! I will be stalking your site until you post your photo shoot! I gave you the weekend to get the photo shoot done, and still nothing??!! We're all holding our breath! Are you the secret grandchild of Elizabeth Zimmerman? That red is stunning-it almost glows. Sundara and you make an excellent partnership! Can't wait to see the finished shoot. Hi Jared, an award for you here : http://melusinetricote.canalblog.com/archives/2008/07/15/index.html, because I love your blog and your designs ! 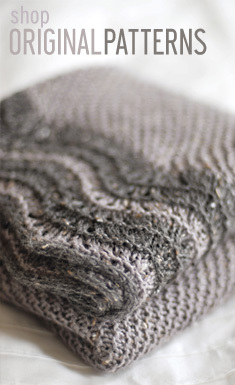 The sweater is so lovely, and as always, the post was a pleasure to read! You're right -- that's gorgeous yarn and a great pattern. Such a rich color. Looks great! I've just discovered your blog and I LOVE what I'm seein'. This jumper is spectacular, but I also love your other projects and designs. Words such as sophisticated, elegant and structural come to mind. Methinks I shall be popping back some more - your Red Light Special is calling to me! I loved your site blog, i have got a site/ blog, go http://agulhaetricot.blogspot.com/ I am from Brasil, my city is Pelotas, in Rio Grande do Sul. Thanks for the links ! ! ! may sell a wide variety of items in their stores. consisting of integrated circuits,transistors,electrolytic capacitors. http://topmobilephonestore.wikispaces.com/ Retailer and wholesaler of mobile phones and Bluetooth headsets. integrated circuits, connectors, capacitors, diodes and transistors. web site registration and watch service. parts. Online line card part search.